Shares in Africa-focused Gem Diamonds (LON:GEMD) skyrocketed Monday morning after the miner announced the recovery of what it qualified as the fifth biggest gem-quality diamond ever found. The 910-carat, D colour, Type IIa rough diamond was unearthed at the firm's flagship Letšeng mine in Lesotho. According to analysts at Liberum, it could fetch as much as $40 million, based on previous sales of large stones. The company’s stock jumped more than 17% on the news by midday Monday, the biggest intraday gain since 2010, trading at 93 pence. To date, Gem Diamonds has recovered ten 100-carat-plus stones from its Letšeng mine in Lesotho, and five of the 20 largest white gem-quality rocks ever found. Since acquiring Letšeng in 2006, Gem Diamonds has found now five of the 20 largest white gem quality diamonds ever recovered, which makes the mine the world’s highest dollar per carat kimberlite diamond operation. To date, the company has recovered ten 100-carat-plus stones at Letšeng. One of them, a 357-carat stone found in 2015, sold for $19.3 million. 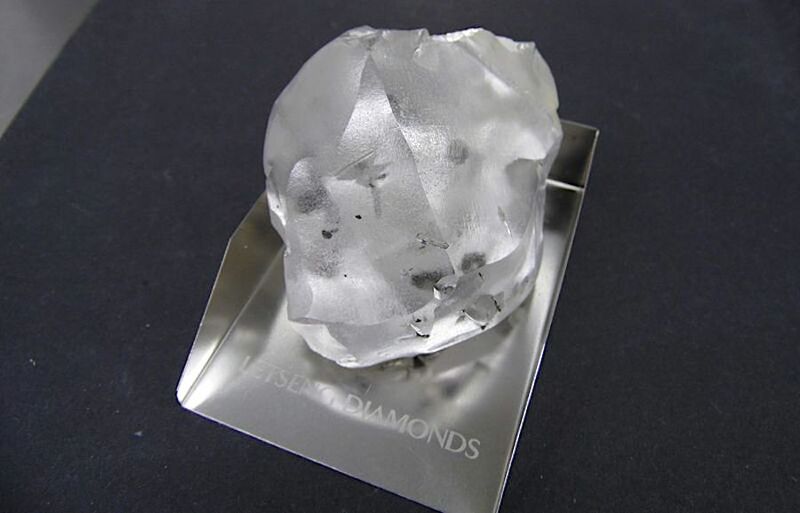 “This exceptional top quality diamond is the largest to be mined to date and highlights the unsurpassed quality of the Letšeng mine,” em Diamonds' chief executive officer, Clifford Elphick, said in the statement. Previous to today’s announcement, the biggest diamond dug at that mine was the 603-carat Lesotho Promise, found in 2006. At an average elevation of 3,100 metres (10,000 feet) above sea level, Letšeng is also one of the world’s highest diamond mines. The biggest diamond ever found was the 3,106-carat Cullinan, dug near Pretoria, South Africa, in 1905. It was later cut into several stones, including the First Star of Africa and the Second Star of Africa, which are part of Britain's Crown Jewels held in the Tower of London. Lucara’s 1,109-carat Lesedi La Rona was the second-biggest in record, while the 995-carat Excelsior and 969-carat Star of Sierra Leone were the third- and fourth-largest.